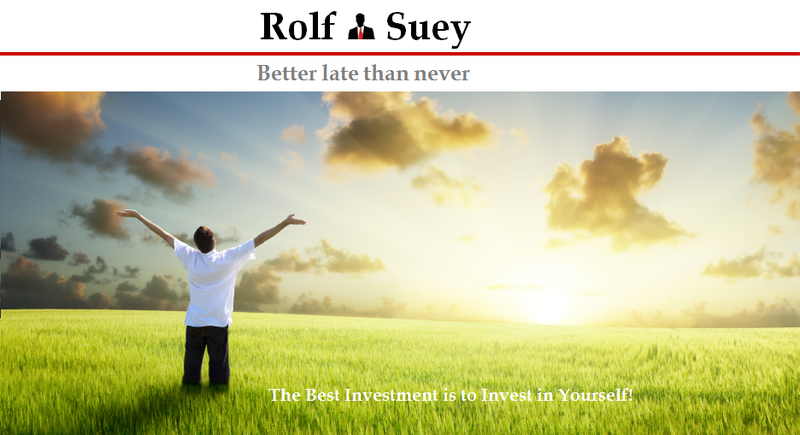 Rolf Suey - Better Late Than Never: Recent Actions - Sold Telco! Short Term Bearish, Long Term Still Bullish! Recent Actions - Sold Telco! Short Term Bearish, Long Term Still Bullish! It comes to a surprise to me that IDA announced a fourth Telco. Considering the weak economic conditions, I am not sure why IDA wanted a fourth telco NOW. Yeah, IDA mentioned it is for the sake of the consumers having better choice. We already have three to choose from. Not enough for now? How about we should have another Broadcast company since Mediacorp has been producing year over year lousy TV serials. Most likely to me, it seems the long term vision of Singapore, planning for the 6.9 million population by 2030. Perhaps this cannot be one of the reasons by the lips of IDA during the announcement as it will probably cause a rant among local-bred Singaporeans. Or maybe Keppel will sell her M1 stakes to Starhub? Today, I made sales of both Starhub and M1 that I owned in my SRS. 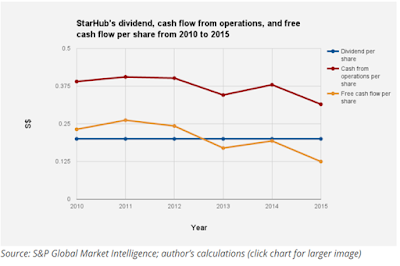 For Starhub, I had owned the stock since 2013 and bought it over $4, and subsequently averaged down. For M1, I recently bought it at $2.6 hoping that the fourth Telco will not be announced. Including dividends, for both trades, I still incur minor losses. The fourth Telco will offer service as early as Apr-2017 and then another bid for the 700MHz band around End 2017. Therefore throughout now till end of 2017, I anticipate great volatility of share prices of the incumbent telcos. 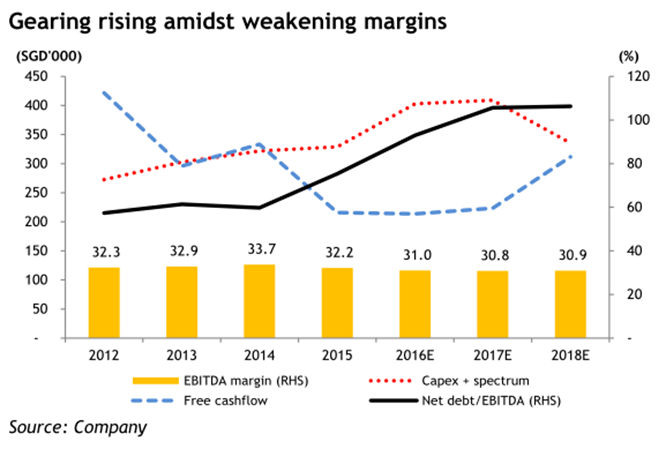 And in an already crowded market where cashflow from TV/Mobile are declining plus the current frail economic conditions, I am anticipating lower pricing of Telco in the short term. Starhub had somewhat assured to pay out 20c DPS, which is an attractive 5.8% at current pricing of 3.46. This is despite that in FY15 that their net profit is flat at 0.5% growth on a 2% decline in mobile revenue and a 3% drop in fixed network services. Pay TV and broadband is still resilient even in the face of fierce competition. 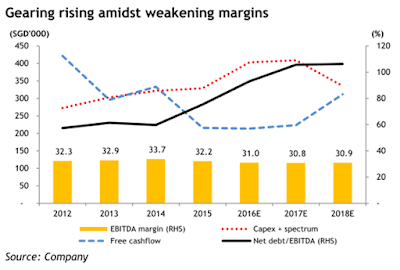 Furthermore, gearing is set to rise as capex will remain high at 13% of total revenue. Starhub also expect lower handset sales in 2016. 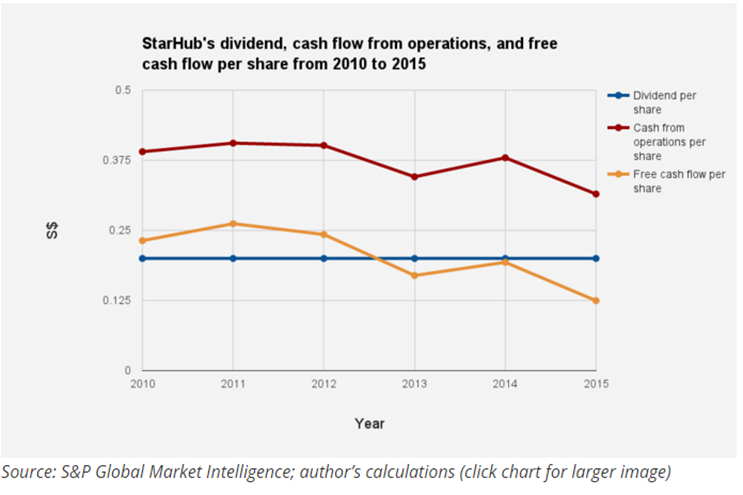 The most discerning news is whether Starhub can maintain its dividends since FCF has been declining over the years? I will not go in depth into M1, since it is smaller portfolio for me compared to Starhub, but it is probably most vulnerable to the fourth telco considering the fact that most of its revenue is from Mobile. Frankly, I am still long term bullish about Telco. Hey...15 years 6.9 million is a long time. Yes, I know. That is not the main reason why I am bullish. If you look at how Singtel and Starhub has evolved over the years since 1990s, it is not necessary that a phone operator will only be a phone operator in the long run. Singtel has transformed from an Internet dial up, fixed line TV, Mobile company to expanding her foothold in Australia, India. Similarly Starhub was just a fixed network and mobile services in late 90s before becoming an Internet service provider when it acquired CyberWay, and then later merged with Singapore Cable Vision in early 2000s. I will possibly wait for better entry points later for the Telco, or I may just put the money in Keppel DC Reit? 1) if long term bullish why sell it at a loss. 2) you did not really justify your long term bullishness. it is just hope. 1) Because u can buy back cheaper later in short to mid term! 2) Long term bullishness is justify by the eventual population growth which I mentioned. That also justify why u can buy back when price drop. Also for long term, if u see how telco in SG has evolved not just as a telco over the years. It is not true that Starhub may remain as a telco only over time. This is the reason and in fact all is written in the last section.